Je ne vais jamais à la gym. I never go to the gym. Je n'écoute jamais le prof. I never listen to the teacher. Notice that to say "never", you use ne.. jamais around the verb. Note: ne becomes n' when in front of a vowel or mute h.
Je ne vais jamais à l'école à pied. Il ne conduit jamais sa voiture. Nous n'allons jamais faire ça. We're never going to do that. i know the verb écouter takes a direct object and in the example above (Je n'écoute jamais le prof) it's rather obvious. in another lesson however, there's an example like (tu n'écoutes jamais Alice).. my question is: how can i tell the meaning of the sentence, i mean when i read the example i thought someone is saying to Alice that she never listens, not the actual meaning of someone is saying to another that he\she never listens to Alice! Alice, tu n'écoutes jamais!= Alice, you never listen! Sorry, hit the wrong key. Why is the syntax not <> It seems from the examples that you still use the regular articles, whereas other forms use <> I don't see an example that offers a direct comparison, so maybe I've missed something? Sorry, my computer is doing strange things? Why is the syntax not "Je ne mange jamais DE tomates?" Other negative forms use "Elles n'ont plus DE sucre." explain all the articles in detail. Have you read the corresponding lessons? Not sure about your question, could you explain? Je mange une pomme. -- I eat an apple. Les voisins ont acheté une nouvelle voiture. -- The neighbors bought a new car. Here an example where the French takes a COD but the English does not. Tu m'attends? -- Are you waiting for me? By the way, it might be a good idea to goolge the term. Il a téléphoné à son copain hier. -- He phoned his friend yesterday. In micro quiz no. 1, the answers all begin 'Frodon' rather than Frodo. Hi Tamani, in the orginal French translation, his name was Frodon. Came here to report the same. Maybe add note about this so people know? I've amended the hint to add that. Thanks for the suggestion. We (in english) have the idiomatic expression: "Never say never..." Do you have one similar? "Ne jamais dire jamais?" Or something else? Il ne faut jamais dire : fontaine je ne boirai pas de ton eau. I listen to my mother. But does the order change if the verb tense changes? Can I say " Il n'a rien mangé? I talked to a native speaker and cleared this up. "Il n'a rien mangé" is the only correct form. Similarly "Il ne m'a rien dit" is correct, whereas "il ne m'a dit rien" is infact incorrect and sometimes heard being used by small children. I hope that clears this up. Bonjour Diana, One point of emphasis is that there is a very large gap between written French and spoken French. 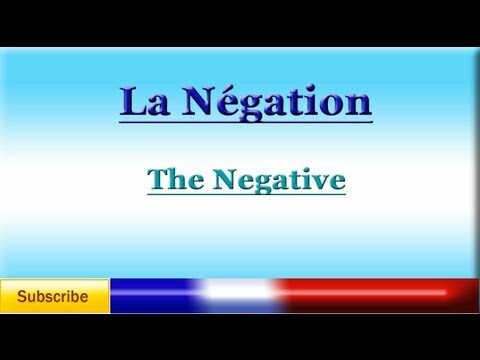 I learned that the negation using le passé composé is in the form: noun + ne + auxiliary verb + negation, i.e. pas, rien, etc. + past participle. While le passé composé is the conversational past preferred, I do believe the correct syntax is like noted above. Bonjour Mohsin. Je voudrais t'aider mais je ne vois pas de question dans ton mail. -- Chris. Bonsoir Mohsin, Je serais très ravi de vous aider aussi. Avez-vous une petite question?